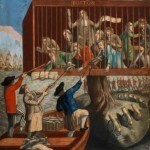 The conservatives in London had always been appalled by some of the American responses; after the wilful destruction of the Boston Tea Party, many of the hitherto moderates also believed that tough action was required. It was decided to hold the colony of Massachusetts responsible for its actions: to punish its legislature, bring its rebellious element to obedience and to force it to reimburse the British East India Company for the destroyed tea. A package of legislation, four separate acts, was quickly drafted and rushed through parliament in the spring of 1774. The British government would call these the Coercive Acts or the Punitive Acts. To the Americans, they became known as the ‘Intolerable Acts’ because their consequences could not be endured. These acts led to paranoia, escalation of revolutionary tensions and military mobilisation in the colonies. The eventual outcome was the skirmish at Lexington-Concord in 1775 and war between Britain and the American colonies. The most politically significant of the legislation was the Massachusetts Government Act (1774) which effectively removed the colony’s charter, sacked its assembly and implemented a form of martial law. The royal governor would be replaced by a civilian governor, and all positions in the government – councillors, judges, sheriffs, notaries – would be appointed by the king rather than elected. Unauthorised town or public meetings were declared illegal; such gatherings could only be conducted with the written approval of the governor. Democracy and representation were temporarily withdrawn in the colony of Massachusetts because, it was claimed, of irresponsible behaviour by the legislature and local governments. Closely aligned to this statute was the Administration of Justice Act (1774) which required all British officials charged with offences or crimes to be extradited and tried in England (a virtual no-confidence vote in the colonial justice system). The second pair of Coercive Acts had a more practical impact. The Boston Port Act (1774) closed the city’s port to all sea traffic, until such time as the colony reimbursed the British East India Company (for its lost tea) and the British government (for customs duties). The economic and social impact of this legislation was considerable: no imported goods whatsoever could be shipped into Boston and no exports could be launched, causing considerable damage to the city’s merchants. The colony’s deepwater fishing fleet, most of which was based in Boston, was unable to leave the harbour, leading to a dramatic reduction in the availability of fresh fish. 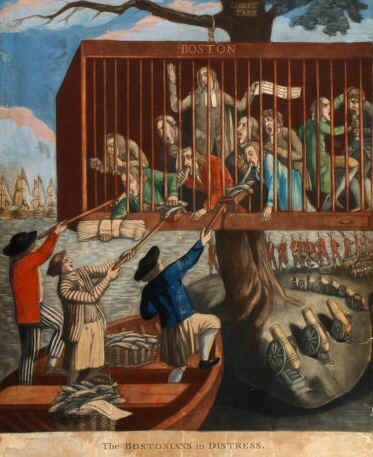 Colonial propagandists compiled cartoons showing Bostonians behind bars (see picture, Bostonians in Distress) or forcibly held down by British ministers (The Able Doctor, or America Swallowing the Bitter Draught). On top of the punitive measures of the Boston Port Act came another instalment of the Quartering Act (1774) which applied not only to Massachusetts but to all 13 colonies. Whereas the previous act had required Americans to house soldiers in barns, outbuildings and stables, this time where necessary they had to be quartered in vacant private homes. Colonial assemblies were also required to supply soldiers with basic necessities such as food, cooking utensils and bedding.